Revols is a Canadian startup with a neat concept: Bluetooth headphones with a new kind of custom-molding technology—one that doesn’t require a specialist, and can be done at home in basically no time. They have the custom-molding tech up and running, and now they’ve launched a Kickstarter to try and turn the headphones into reality. The rubber earbuds are the part that get customized. They’re a lot bigger than the in-ear buds you’re probably used to, about the size of a quarter and as thick as a stack of three. When it’s unmolded, the bud is squishy like blu-tack, so it conforms to the contours of your ear. It doesn’t look like it should be comfy to wear—the size is definitely offputting—but it’s actually surprisingly good. The molding process goes something like this: put the rubber buds, attached to the headphones as per usual, in your ears. Then, connect the headphones to a smartphone, fire up the (iOS or Android) app, and it walks you through the pairing process. When you’re ready to start, you push a button on the app, and the earbuds start the process of hardening. 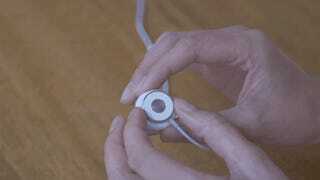 The headphones send an electrical signal to the earbuds, which begins the transition from soft to hard. It takes about 60 seconds, during which you feel heat in your ears. (Side note: Kickstarter for heated headphones next?) 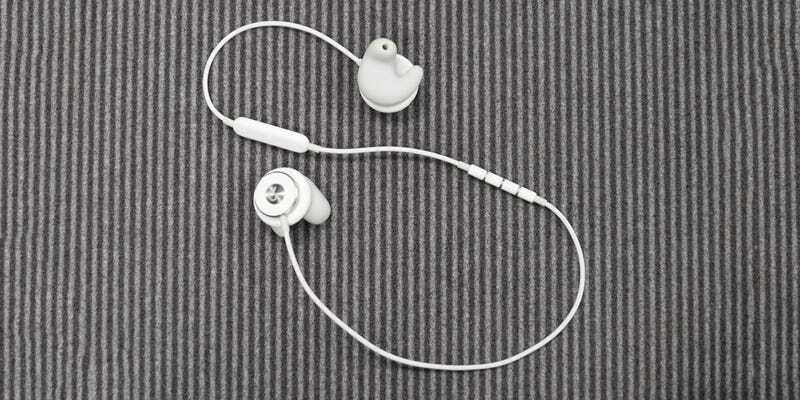 Once it’s over, the earbuds are noticeably stiffer, and actually molded to the shape of your ear. While the custom-fit process is pretty fantastic, and clearly functional at this stage, there’s more of a question over the rest of the headphone part. Revols has partnered with Onkyo, a storied Japanese audio manufacturer, and they’ll be the ones doing the drivers that make actual sound. But at the moment, there’s no working audio demo, so if you back the project, you’ll be assuming that the audio parts will all come together as planned. The clip-on battery pack promises six hours of extra playtime. Drivers aside, the rest of the headphones are seriously well thought-out. There’s a promised eight hours of battery life, directional mikes to feed in outside noise if you want to hear street sounds while running, a clip-on battery pack, and a surprisingly clever (if proprietary) charging connector. Even the bezels—yes, headphones have bezels now—are neat, letting you choose to route the cable over your ears or straight down. If you’re buying what Revols is selling, the Kickstarter price is $200, a goodly discount from the promised $300 RRP. Shipping is slated for sometime in June, although as ever with Kickstarter, buyer beware.